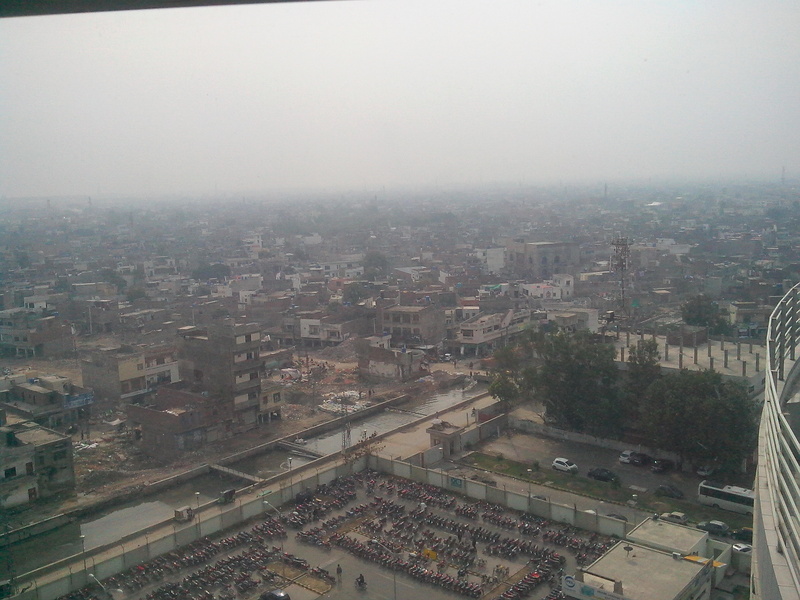 A room with a view - Lahore: Smog or pollution? Check out the skyline and the rows of housing in the following image. Notice anything funny? We don’t seem to have any green vegetation by and large, (except for a row of trees near the parking lot). We have a lot of flat roofed homes -in other words, there is plenty of room for solar panels (and roof gardens) – only if the technology was affordable and available to an average Joe (read Aslam) and we had thought of green roofs or roof gardens when we built our homes and could afford them to begin with! Notice the haphazard development? The chaos and lack of cohesiveness in this image? No clear zoning. Residential, commercial, and sewage drain all co-exist peacefully together. No, this is not a shanty town or a slum. It’s a middle class residential area adjacent to Model Town. 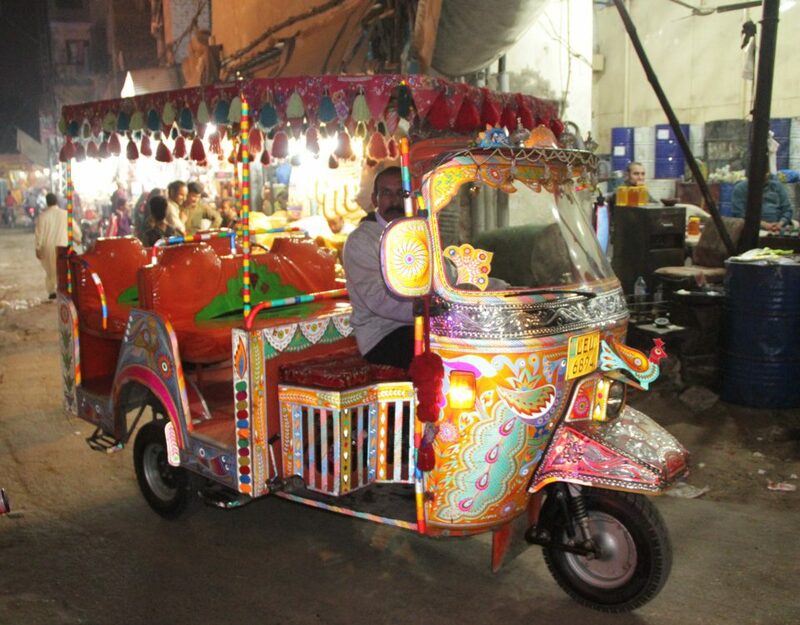 (Though, its tough defining the middle class now in Pakistan – is it an income group that can afford their own place, runs their own transport, sends their kids to private schools and can afford a UPS, fridge, cable TV, smart phone, desk top computer so on and so forth? No, I am not describing the rich here. The middle class has to do all that too. All Pakistani citizens regardless of their income group have to provide these basic amenities for themselves – alternative energy solutions, private schooling, private housing, private transport, private security, private blah, blah, blah). Did you check out the garbage in the vacant lots? Bottom line, Lahore is becoming highly polluted – let’s all plant trees. (This, we can do at an individual level and it doesn’t cost a lot, though the tree might take up some of our time and TLC to grow and thrive). This is doable. LAHORE: Rapidly increasing industrialization and commercialization has turned the provincial metropolis — once known as the City of Gardens — into one of the most polluted cities in the country. Quetta Peshawar and Lahore are among the most polluted cities of the world, a WHO report said. Although Paris has leapt into the headlines over an alert for dangerous atmospheric particles, it does not ordinarily count among the world’s most polluted cities. According to a 2011 World Health Organization (WHO) report Quetta shares fourth place on the most polluted city list along with Ludhiana, India. Peshawar and Lahore also make it to the top 10 list. IN a ruthless manner, decades old historical trees have been uprooted and cut to construct a sewage channel which ignited a heated debate among environmentalists who thought that there was no need to cut these trees. The trees were cut to construct a concrete drain, which crossed the entire garden (from The Mall to Lawrence Road). The environmentalists said trees were habitat for the resident bats of the garden, which were now dislocated. Prof Dr Aminul Haq, ex-Dean of Sciences GCU Lahore, said the entire garden was surrounded by a sewage channel, which was traversing across the garden and could easily be cleaned up after some basic treatment and removal of sludge. He said building up such a huge elevated structure in the middle of the garden was unnecessary and could be avoided. Dr Aminul Haq, who is a botanist and ecologist, witnessed the slaughter of these historical trees. Talking to The News, he said ‘I have counted about 72 logs of different species of plants and taken photos in a hurry because there is a possibility that the garden administration might remove all the traces of evidence.’ He said it was sad to see the way they have planned the whole affair. LAHORE – Huge discharge of untreated domestic and industrial waste has turned River Ravi, the most important source for maintaining aquifer level in Lahore, into a dumping pit, causing serious health and environmental hazards, The Nation has learnt. LAHORE – An agreement was signed between the Punjab government and Sweden on Wednesday regarding inspection and certification system of vehicles. Punjab Chief Minister Shahbaz Sharif was the chief guest at the ceremony held at Model Town. Secretary Transport and President OPUS Group of Sweden Carl Magnus Greko signed the document. There are certain events that stand as broader metaphors. One of these came this weekend, when a fault in the National Transportation and Distribution Company plunged some 80 percent of the country into pitch darkness. This is not an entirely unprecedented event. We have faced similar blackouts before. But in so many ways this plunge into darkness symbolises the kind of anarchy we live in: an anarchy where nothing is certain, where little is known and where life moves forward in staggering steps as people attempt to cope with the daily demands of life lived in these circumstances. Do we want Lahore to become like Delhi? This year, the smog is the worst ever – in history of Lahore. It started in November…strange rumors circulating – Its traveled from India. It’s the result of tear gas shelling in Islamabad ‘coz of Imran Khan’s call for another ‘dharna,’ blah, blah…I think its home brewed. Urbanization, industrialization, construction work, pollution, and cutting down of green cover (trees) to make way for more cars, metro buses, and what not…Lahore doesn’t have clean air. LAHORE – The persistent spell of the toxic smog that looms over Lahore and other parts of Punjab is not essentially a by-product of pollution produced within Pakistani boundaries but is largely contributed by a perpetual rival – India, NASA observed in its forecast. A forecast by NASA points that high levels of “fires and thermal anomalies” in Pakistan are caused by a colossal amount of toxic haze rolling into Pakistani Punjab from Indian Punjab, putting millions at risk. The smog that heretofore was thought to be an offshoot of vehicular and industrial emissions in Pakistan has its origins in Indian soil, a fact that many experts had already speculated. The report says that the pollutants are from staggering amount — 32 million tons (30 billion kgs) of leftover straw — being burnt by Indian farmers, which is an age-old practice. Delhi was engulfed by a blanket of thick smog, causing poor visibility with the air quality index reaching alarming levels across the city. Extravagant fireworks in Diwali celebrations across the border have also been cited as one of the major reasons for the striking amount of pollutants in the air at the outset of winter this year. However, images published by NASA suggest that burning of crops in the neighboring states of Punjab and Haryana could be the biggest reason behind the air pollution in the region. Dr Qamar uz Zaman Chaudhry, national climate change expert and former Director General of Pakistan’s Meteorological Department also believes that the main source of the pollutants in our lower atmosphere is Eastern Punjab where all the coal-based industries are centered (across the border in India). 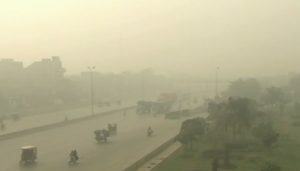 Lahore and other areas of northern and central Punjab have been encircled by a thick layer of smog with sunshine becoming totally imperceptible as haze spreads over the sky. Motorways have been reportedly blocked and flights may soon have to be delayed or canceled. A spate of fog-related accidents was reported across Punjab. According to Dr Ghulam Rasool, Director General of the Pakistan Meteorological Department, the situation is going to last till the end of December, as it hasn’t rained in the central Punjab since October. Dr Sajid Rashid, Principal Environment College, University of Punjab, has blamed paddy stubble burning in Indian Punjab as the main reason for rising level of smoke in the air. “Unfortunately, in Pakistan, we lack the equipment for real-time monitoring of air quality,” he regretted while talking to DP Global. Smog can be responsible for any ailment from minor pains to deadly pulmonary diseases such as lung cancer. 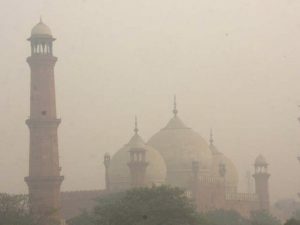 LAHORE: The latest smog situation has left Lahore in a choking haze, but even in the past environmental experts and activists have been vocal about air pollution issue. Now NASA (the National Aeronautics and Space Administration) has pointed out that burning of crop stubbles may be a major reason for a smog blanket in New Delhi, and also in Lahore, as the map shows several places in West Punjab that have thermal emissions. Both East and West Punjab have two growing seasons — one from May to September and the other from November to April. In May and November, Punjab farmers typically sow crops and vegetables for the next season; but before sowing, they often set fire to fields to clear stubbles of previous crop and make them suitable for next sowing. Experts’ views vary on the matter. As for an alternative method for crop stubble burning, the best method is to plough the stalks back into the earth where they can decompose into humus. Environmentalist and researcher Noman Ashraf says that labs of the Environmental Protection Agency (EPA) are not operational, and without any empirical evidence, there can hardly be any crackdown on factories and other offenders. “There are third-party labs which are doing this work, but the EPA has not bothered to renew their collaborative licences with them either,” he says. According to him, the Air Quality Index monitors were installed at five points during the last decade, but because the instruments were not calibrated they eventually became useless. “If we look at China and India, they at least have figures to go by,” says Mr Ashraf. EPA argues that it has state-of-the-art labs and regular readings. “We only had one purchasing issue… otherwise all our equipment is working just fine,” says an official of the EPA. 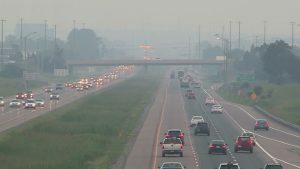 Now with air pollution levels high enough to cause concern, EPA has worked out readings of between November 2 and 4. And these reveal some startling figures. For example, nitric oxide should not be more than 40mcg per cubic metre but during this period Mall Road saw over 306mcg/cubic metre, and Mohlanwal (near Bahria Town) 332mcg/cubic metre. Particles less than 2.5µm (micrometres) are called PM2.5. They are approximately 1/30th the average width of a human hair. The benchmark for PM2.5 should be 35mcg/cubic metre, but none of the figures recorded during the period fell within this range. Readings were similar for PM10, whose levels should have been below 150, but were recorded to be higher in Shahdara area (264). However in other places levels were below 150. Sulphur dioxide, which should be well below 120mcg per cubic metre, was seen highest in Mominpura, an appalling 1,373mcg per cubic metre. The carbon monoxide levels, which should have been below 5msg/cubic metre, were recorded at 21mcg/ cubic metre on Mall Road, and 17mcg/cubic metre at Mohlanwal, while at other places the levels were slightly higher than 5. Naseemur Rehman Shah, a spokesperson for EPA, says his department has urged the agriculture department to take notice of the problem, but no action has so far been taken. But when asked about the trees cut down in Lahore because of various development projects, Rehman says the EPA did not disallow it because that was the last resort. “The government has announced that for every public sector project one per cent of the total cost has to go into tree plantation,” he says. He adds that even corridors like the Motorway are having trees planted along them. “Sometimes tree cutting has been allowed because it was the need of the day,” he says. He says that around 300 units have been shut down by the Punjab government in the recent past and these include large- and small-scale industries. Regarding air pollution, Rehman says that currently there are about 3,000 cases under trial in environment tribunals from all over Punjab. But apart from industries, there is the huge issue of traffic as well. Rehman says that traffic congestion, bad roads, increasing number of vehicles, old vehicles with bad engines, and banned vehicles were main causes and many were still operating. 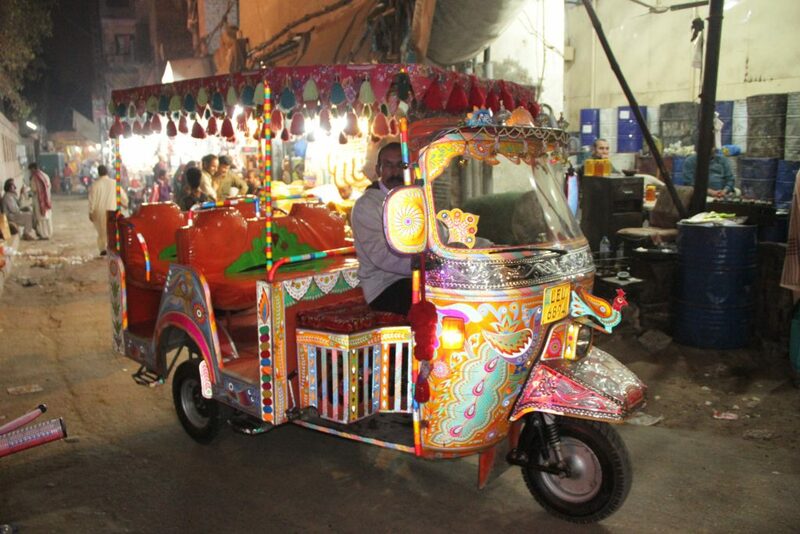 The two-stroke auto and cycle rickshaws both are seen running despite being banned. Rafay Alam, an environmental lawyer, says unless there are proper metering systems, not just in Lahore but all over Punjab, no one could make any conclusive claims. times the limit India’s government considers safe.